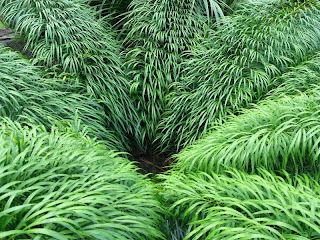 Over at Jurassic Garden you can get a 1 inch seedling Cycas debaoensis for $150.00 or an 11.25" specimen for a little over $3, 500. That this rare and only recently discovered (late 90's) cycad found in isolated limestone cliffs in southern China is probably one of the most coveted cycads for cycadophiles is putting it mildly. But once you get a look at this plant it becomes immediately apparent that it does brake the mold of your typical cycad morph. Most notable are the bipinnate leaves (two leaves), giving it a distinctly lush appearance. Contrast this with the more typically pinnate leaves of most cycads on the left. "Bamboo like" is a common description of this cycad and like bamboo this species is relatively fast growing, especially for a cycad. Interestingly this cycad has a subterranean caudex, meaning that the growing tip/main trunk is largely underground- so it lacks the typical "palm tree like" trunk of most cycads . Artists trying to depict Mesozoic cycads should not feel limited by the typical cycad shape and feel- a brief investigation into extant cycads reveals an unexpected diversity of form and habit. Doubtless an even greater diversity occurred during the Mesozoic.